ANN ARBOR—University of Michigan President Mary Sue Coleman wants to ensure that more students travel abroad to experience other cultures, seek solutions to world problems and learn to thrive in a dynamic global environment. Putting significant resources behind the mission, Coleman and her husband, Kenneth M. Coleman, are giving $1 million toward scholarships for U-M undergraduate and graduate students to support international study, internships, service work and other opportunities. The gift will be part of the Victors for Michigan campaign to kick off Nov. 8 and will count toward the campaign’s highest priority, raising funds for student support. The gift was announced Tuesday at Coleman’s annual Leadership Breakfast where she highlights the university’s accomplishments and announces key initiatives for the university. 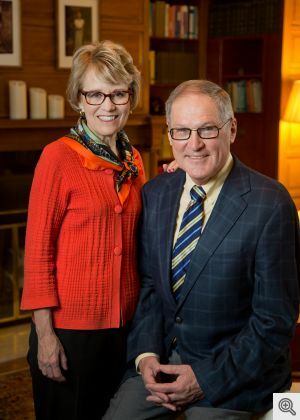 With her husband, Coleman has been the most philanthropic president in U-M history. This gift brings their total giving to $1.79 million during her 11-year tenure as president. Coleman plans to retire in July 2014. “There is no better way to understand the universality of human experience, as well as the diversity thereof, than by experience abroad, which should be an important part of both undergraduate and graduate educational experiences,” he said. In 2009, the Colemans made a gift of $25,000 to create the Mary Sue Coleman and Kenneth M. Coleman Student Global Experience Fund. This coincided with Mary Sue Coleman’s launch of the President’s Challenge for the Student Global Experience to help increase student study abroad programs. Three times, President Coleman and Kenneth Coleman have donated her salary increases back to the university in support of Michigan students, including in 2012 when the Colemans made a gift of $17,600 for study abroad scholarships. Their new gift will be designated for their Student Global Experience Fund. During her presidency, Coleman has traveled to China, Ghana, South Africa, the United Arab Emirates, Israel and Brazil. She is planning to lead a faculty group to India in November. The university has developed partnerships with universities throughout those countries that have resulted in study abroad opportunities, joint research projects and academic programs. From fall 2011 through 2012, more than 2,240 U-M students studied or interned abroad for academic credit. $500,000 to the Michigan Difference Campaign in 2003 to support the Rackham Graduate School, an undergraduate scholarship program, the Life Sciences Institute, and a fellowship program in the Institute for Social Research. More than $15,000 in 2007 to help boost financial aid for graduate and professional students. Various amounts to several campus units, including renovations to the Trotter House and the U-M Museum of Art.